Social media plays a massive role in the way that we perceive things and it impacts the trust we have for people. 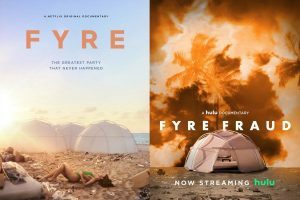 Fyre festival was a festival that was introduced to the world in 2017, Billy Mcfarland wanted to recreate Coachella. He wanted a celebrity based music festival that would attract the public into wanting to attend. This festival was supposed to take place on two weekends in the Bahamas, festival goers were promised high quality food, luxury huts on white sand beaches, exclusive flights and proper luggage care. There were endless promotions, including top supermodels that were being shown on a private white sand beach. Tickets sold out incredibly fast, but no one was aware of what was taking place behind the scenes. The festival was slowly crumbling, the beach they were going to use for the festival was previously Pablo Escobars, but the current owner wanted to change the face of it and specifically stated they wanted no mention of Pablo Escobar.When the add was released however, Billy McFarland explicitly wrote that the island was previously owned by Pablo Escobar, and were late evicted from the island and told they could no longer hold the festival there due to the fact that they failed to follow the one rule that they were assigned. From that point forward, everything else successively went wrong. For starters, the promised luxury villas were non-existent, though they continued to promote them. The beaches were not luxurious, the food was non-existent and now there were excessive issues with the water. Billy McFarland was making promises he was unable to keep; due to the fact that he was lying about all of the money he supposedly had. He was promising performances from people he was not able to pay, he continued to promote a festival that was not able to run. As the day approached a massive rain storm hit the Bahamas, and poured over the ‘’luxurious’’ tents that were no thicker than a summer camping tent. Due to the rain all of the beds got excessive damage and were drenched in water, he did not remove them. People arrived slowly after and were absolutely disgusted with the what was before them, the disappointment was presented before they even landed in Bahamas. The exclusive flights they were promised were delayed for hours and were not anymore luxurious than a coach seat on a regular plane. When they arrived they were all piled onto a bus and brought to an island that was not on a private area and was not even the original location that was promised. When they saw the tents people were floored with anger and disgusted because there was a strong feeling of disbelief that this was what was considered luxurious huts. Upon arrival there was an excessively long line and complete disorganization. At one point it began to get so hectic people had been there for hours with no food and no proper living space that they were told to just pick a tent and first come first serve. They received a grilled cheese sandwich and a couple leaves of lettuce and called it a salad. People began leaving and that is when the law suits began to flood in and all the truths finally came out. ​Billy McFarland, the 27-year-old founder of the company behind the festival, was ​sentenced to six years in prison in October and faces a $26 million forfeiture order. Many of the Bahamian companies who helped create the Fyre festival, have yet to receive any of the money. Netflix has come to the conclusion that they will donate a percentage of the money will go to the companies who have gone unpaid. The FYRE Festival has truly set a precedent for how we use our social media and has enforced an AD hashtag that allows us to decipher what people are being paid to post and what they choose to post.